I am writing to you because I want you to know what is in my head, heart and actions in this most difficult time. I have always wanted to believe in the inherent good in people, but this past weekend, when I saw individuals bearing torches, dressed in KKK regalia, carrying white supremacist shields, flanked by individuals equipped with long guns and a car driven by a person with the goal of mayhem and murder in the streets of my country, I knew that I was witnessing evil. It is an evil that sabotages the values of my country, that harms my community, and that causes pain in my family and in me. I am anguishing over the many emotions I feel: anger, anxiety, confusion and outrage. I want to ensure that you know there is no ambiguity in my reaction to recent events or in my sense of responsibility as an elected individual to be committed to do what I can, and feel I must, to fight this evil. 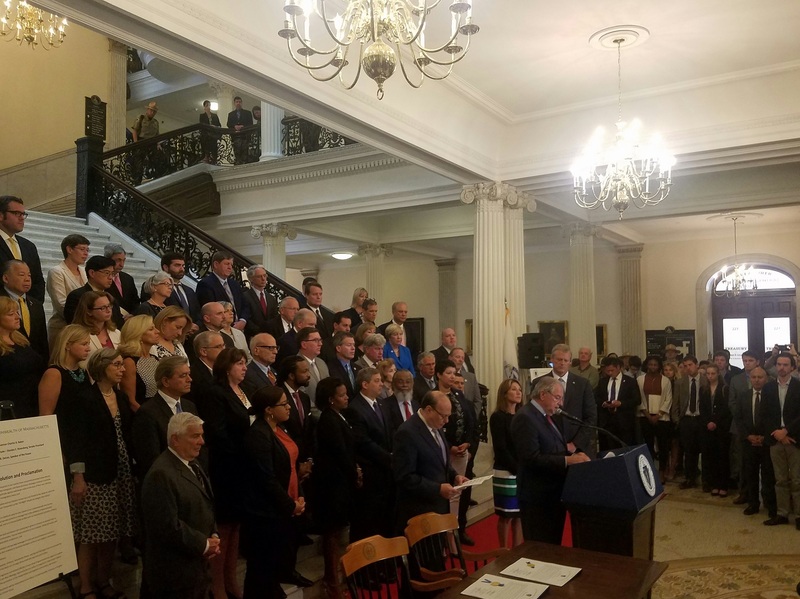 As your State Representative, this morning, I joined with Speaker DeLeo, Senate President Rosenberg and Governor Baker by signing and bearing witness to the resolution that follows below which will be delivered to the Mayor of Charlottesville, the Governor of Virginia, and the President of the United States. Speaker DeLeo reads a portion of a proclamation and joint resolution adopted on August 17. As a member of our community, I am dedicated and re-dedicate myself to the work of concerned individuals and groups including the Needham Diversity Initiative, the Human Rights Committee, the Interfaith Clergy and the Human Rights statement of the Board of Selectmen, and I will promote and support the Human Rights Speakers Series in Needham this fall. 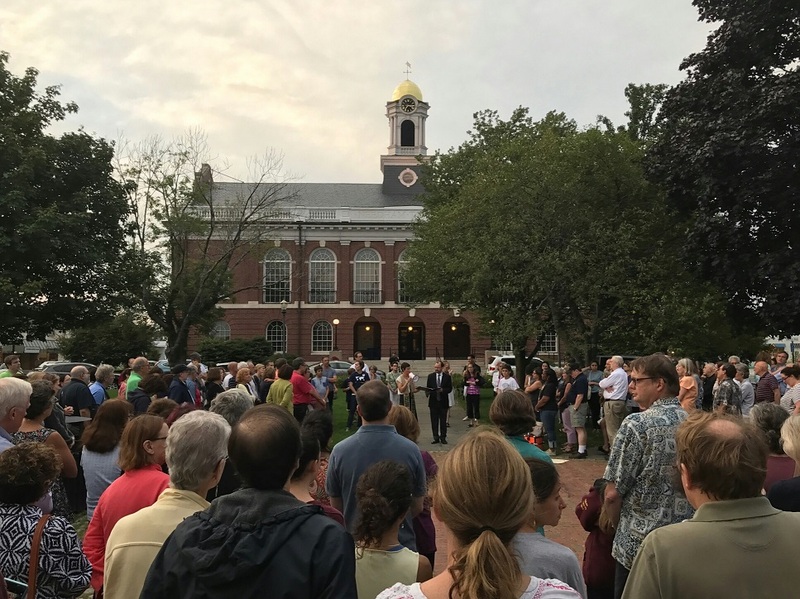 Needham residents gather on the town common for a solidarity vigil on August 15. In my personal relationships, I will strive to more deeply understand the pain and harmful impacts of hatred on individuals based on race, ethnicity, religion, gender, sexual orientation or disability. I will stand in solidarity and support with them. I will engage anyone who explicitly or implicitly acts as if any person is not deserving of respect. I will hold my anguish and not dismiss it for a more comfortable feeling. 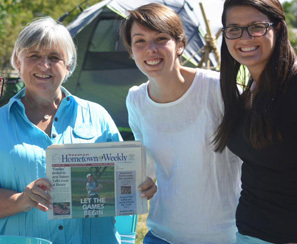 I will hold my family, my community, and my country in love. RESOLVED, that we urge law enforcement agencies and elected officials at every level of government to condemn white nationalist and neo-Nazi ideology, to vigorously pursue justice in response to hate-fueled violence and work to ensure the protection of the marginalized and targeted communities. RESOLVED, that copies of this resolution be transmitted to the Mayor of Charlottesville, Governor of Virginia and President of the United States.